Pioneers in the industry, we offer sugar syrup manufacturing plant and sugar syrup making machine from India. Oral liquid manufacturing plant comprises of sugar syrup vessel, online sugar syrup pre-filter, manufacturing vessel storage vessel, vacuum system for transfer of sugar and sugar syrup, product piping, control panels and transfer pumps. The construction of the complete system is done in a way that allows for plant to be easily handled by single operator, thus saving on man- power costs. The system provides option of boiler steam heating / electrical heating to achieve and maintain the desired temperature. 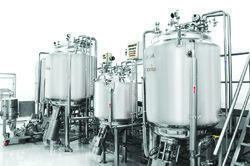 Oral Liquid Manufacturing Plant is manufactured under GMP guidelines. The design of the plant is tailor-made. All the contact parts are made of AISI 316L stainless steel. Crevice & Dead leg free design, Contact surfaces to less than 0.5 from inside. Food Grade Gaskets in compliance with FDA. Zero Dead-Leg Flush Bottom Diaphragm Valves. Load cells with control unit for the main manufacturing vessel. PLC based panel with touch screen HMI and menu options for the panel. We are manufacturers & suppliers of Sugar Syrup Making Machine. Sugar Syrup Making Machine is used for preparing continuous sugar syrup using sugar handling system. Sugar syrup is prepared using high speed stirrer and electrical/steam heating at required temperature. The highly efficient transfer pump discharges the final product to the storage vessel through zero hold up filter press.